Talbots and The Pick Me Up Foundation invite you to an evening of shopping for modern classic Summer styles and refreshments. 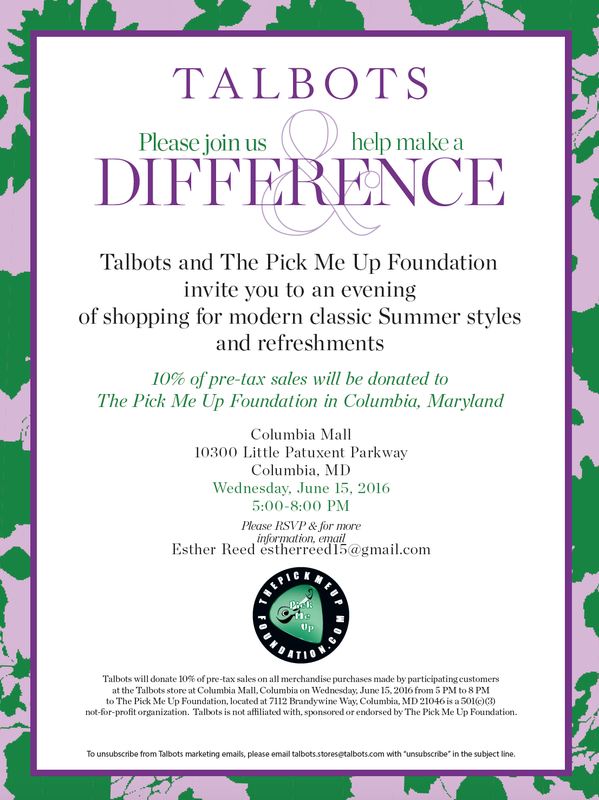 Wednesday, June 15, 2016 5:00-8:00 PM at Talbots in the Columbia Mall. Tonight we awarded the first Aaron Reed Music Scholarship Funds at Hammond High School. $1,000 each. The recipients had to send in an application and were chosen because they have been influenced by music and participated in music, creation, composing, recording, etc. The recipients were Tyler Hess and Samuel Harley. The Pick Me Up Foundation will be at the Van Warp tour this Saturday at Merriweather Post Pavilion in the Not Profit area. We look forward to seeing you all at the event. Merriweather Post Pavillion is located at 10575 Little Patuxent Parkway Columbia, MD 21044. Local transportation can be provided by the Washington Metro Area Transit Authority. When Brian Reed’s son Aaron died suddenly in January 2014, the family looked for a way to honor his life and his passion for music. The result was the Pick Me Up (PMU) Foundation, created in Aaron’s memory to provide musical instruments to underprivileged children, and named after a song Aaron was working on when he died. After a strong response to a request for financial donations, Reed, his wife, Esther, and daughter Julia organized a drive to collect instruments. They ended up with over 250. The foundation gives both donations and instruments to two highly respected music organizations (Hungry for Music and Music is Art) which recondition the instruments and choose the recipients. To date, over 200 instruments have been given to children and school programs. The family plans a live music fundraiser as well as a charity bike ride from Baltimore to Buffalo, where Reed grew up and Aaron lived at the time of his death. 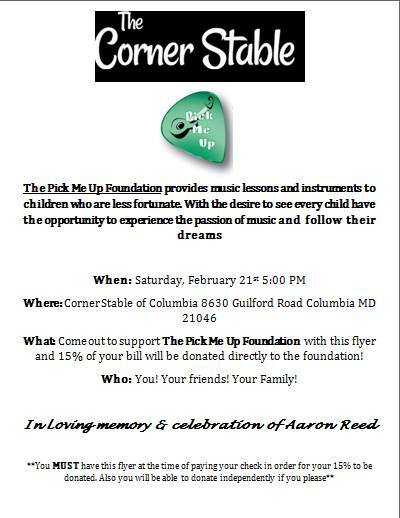 We are super excited for our fundraising event at Corner Stable in Columbia tomorrow. We have over 100 people that have said (via Facebook) they will be attending. Note – you must print this flyer, bring it with you and hand it to your server tomorrow evening in order for 15% of your check to be donated to the Foundation. We look forward to seeing everyone tomorrow. CLICK HERE for directions to Corner Stable.